Green Fairy Quilts: It's finished! 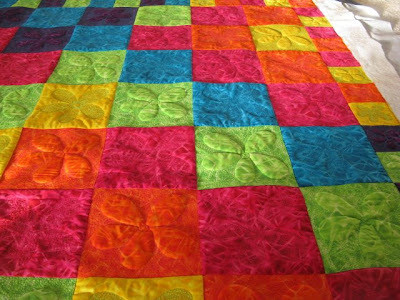 I finally finished quilting this bright quilt. I had the quilt in the machine for a week, it took me roughly 23 hours of non-stop quilting, add in the sore back allowance and breaks and I was standing at this quilt for over 30 hours. I am entering it into the HMQS Quilt show and the theme is Pump up the Color. These bright squares are definitely full of color. I have a booth at the show as well, so if you are in the Salt Lake area May 7-9th, come and check my booth out! 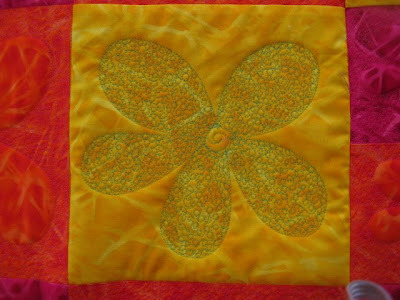 I alternated the squares by quilting the outside of the flower and then the inside of the flower. 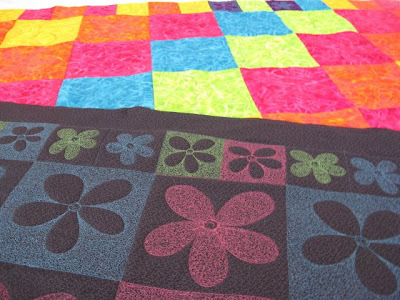 This gives the quilt a 3-D look. The pictures don't give it justice. It looks amazing. The green flower block took 15 minutes (Clint timed me) and the yellow flower block took about 10 minutes. I averaged all 80 big blocks at 12 minutes and came up with 16 hours. Then the outside small squares took 5 minutes each and there are 76 blocks that took 6.33 hours. Here's a picture of the back with the front. I personally like that back more because I am not a huge brights fan, but it's my reversible quilt and I love it! The only thing I wish I would have done was use three more thread colors, but then I really never would have finished. I used over 6400 yards of thread on this quilt! I only need to trim, iron, bind, put a sleeve on and then I will be finished. Any volunteers? I think I am going to call it "Pumped Up Flower Patch." I would love any better name suggestions! call it whatever you want, that thing is on FIRE!!!!!! I sure wish I get that good one day. truly amazing, you are very talented!!!!! and good luck in the show with it. Wow! Beautiful quilt. The quilting is amazing. I like the name you chose. I think it fits perfectly. Good luck to you at the quilt show. Amazing idea for a quilt and even more amazing execution! I love it! I like the name with only a slight variation - "Pumped Up Flower Power". I can volunteer to do the binding and sleeve, but I don't think I could ever part with it to return it to you. So talented. Well there ya go! All that quilting really paid off big time! It turned out absolutely wonderful!! I'm with you...drawn to the back side more but this is only because I liked muted color. Give yourself a big ol' pat on the back girlfriend! Now I have to ask, did you have tie-offs or did you bury every time you had to change those thread colors? Also...our guild has a show in early November...wanna send it here to show too? What an awesome quilt! I absolutely love the quilting on that!! What a great job!! Love the quilt. I liek the back too! So much work! 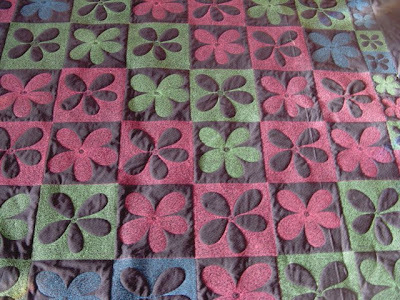 The quilting made that quilt. And the back is just as pretty as the front of the quilt. Good luck at the quilt show. This is absolutely stunning! I hope you win a prize! I would volunteer to bind it for you. :-) But I'm sure you want it to be done all by your own hand. Beautiful work. I hope you win! It is awesome! Wow!!!!!!!!!!!! Wishing you all the luck in the show!!!!!! It's an amazing quilt, both sides, well done, congratulations to you! Well as you know from visiting me, I love brights, which makes us all so different. You have done a great works here! You would have my vote! You would win! And I would hire a masseuse to rub your back as one of the prizes! This is beautiful! Worth all the work you put into it. Good luck at the show! Awesome! What a beauty! Good luck in the show! I wish I could see it in person. It looks like an incredible piece of artwork! I love the bright colors. So pretty!! This is an awesome quilt... what an amazing job you did!! And the bright colors are just perfect. At one time brights were not my favorite either; but things change. So maybe some day this quilt will become among your favorites. Oh that back is SO cool! I have truly never seen anything like it. A work of art! 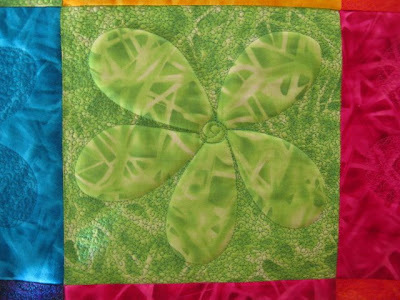 Wow - you did beautiful quilting on this one. Great job! I love the effect you have produced in these blocks. How clever are you?? I hope you win HMQS show...it would be awesome!